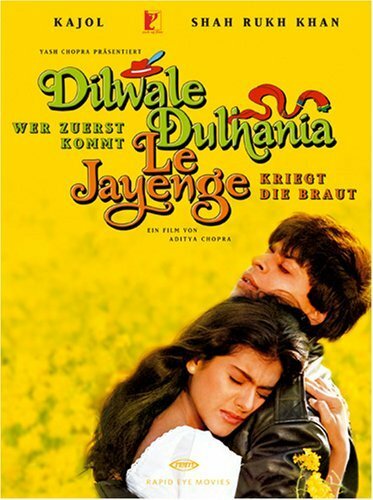 Dilwale Dulhania Le Jayenge also known as DDLJ, is a Hindi language film released on 20 October 1995. A romantic comedy, the film marked the directorial debut of Aditya Chopra, and stars Shahrukh Khan and Kajol. A 4 crore Rs film Crates 123 crore Rs in India and INR 15 crore overseas, the film became the biggest Bollywood hit of the year, as well as one of the biggest Bollywood hits ever. It was declared an All Time Blockbuster, and remains the longest-running film in the history of Indian cinema. As of 2011, it is still playing at the Maratha Mandir theatre in Mumbai. It still earn money from DDLJ. DDLJ completes 832 weeks means 16 year in Maratha Mandir . DDLJ bresks all Records in Indian Cinema.